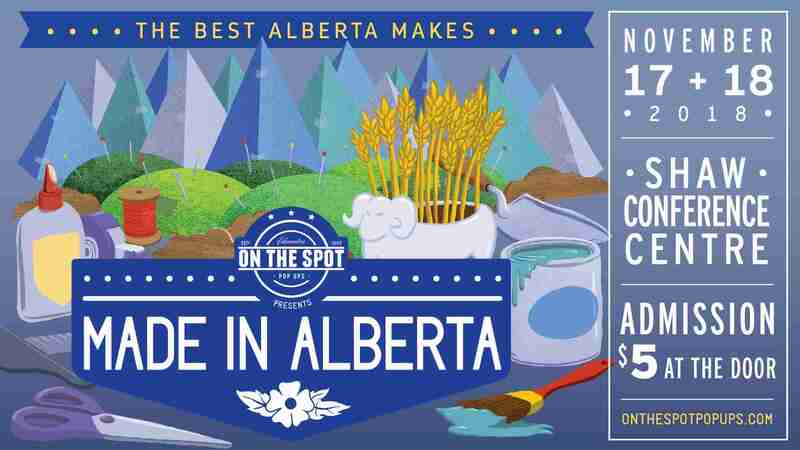 Welcome to the Best Alberta Makes! From the show managers of the largest Etsy Made in Canada show, On the Spot Pop Ups has launched a new art, design and craft show that features only Alberta makers. This allows our community to support an entirely made local economy, keeping a majority of the money spent this holiday season within our community. Popular makers who will be at the show include Not Your Baba’s Ukrainian Foods, who after a successful ATB Boostr launch earlier this year is making this show their first launch in Edmonton. As well WeMet Wire Work who recently created a wire bonsai tree for the City of Whitecourt to give to their Sister City of Yubetsu, Japan. Rig Hand Craft Distillery will also be on hand sampling some of their locally made spirits. They join over 130 jewellery, accessories, home décor, warm woollies, clothing, toys and pet accessories makers and artists from across Alberta. This show also supports local charities like The Christmas Bureau of Edmonton, and 25% of the door admission ($5 per person over 16 years of age) goes to The Nina Haggerty Centre for the Arts, a professional collective of artists with developmental disabilities. The Nina artists will also be at the show selling their art and designs. On the Spot Pop Ups has been bringing made local shows to Edmonton since 2012. Admission: $5 per person, ages 15 and under are free.